Little B turned four and is taking it very seriously! There are a number of things she won’t do now that she is older than three. It is fun and serious to watch her work it all out. A couple of years ago we started a tradition of doing a family out of town trip to a beach for her birthday. We continued it this past weekend by dipping our toes in the Atlantic Ocean. A challenge for these trips is having a sugar free, wheat free cake ready and waiting for her on THE day. Last year we succumbed to a wheaty, chocolaty concoction from a store near the beach. We got a sugar buzz, while also feeling guilty about not following our diet rules. Rules are made to be broken, yes, but with consequences. She pinged and ponged, then crashed. Not fair to a body, but we did it anyway. 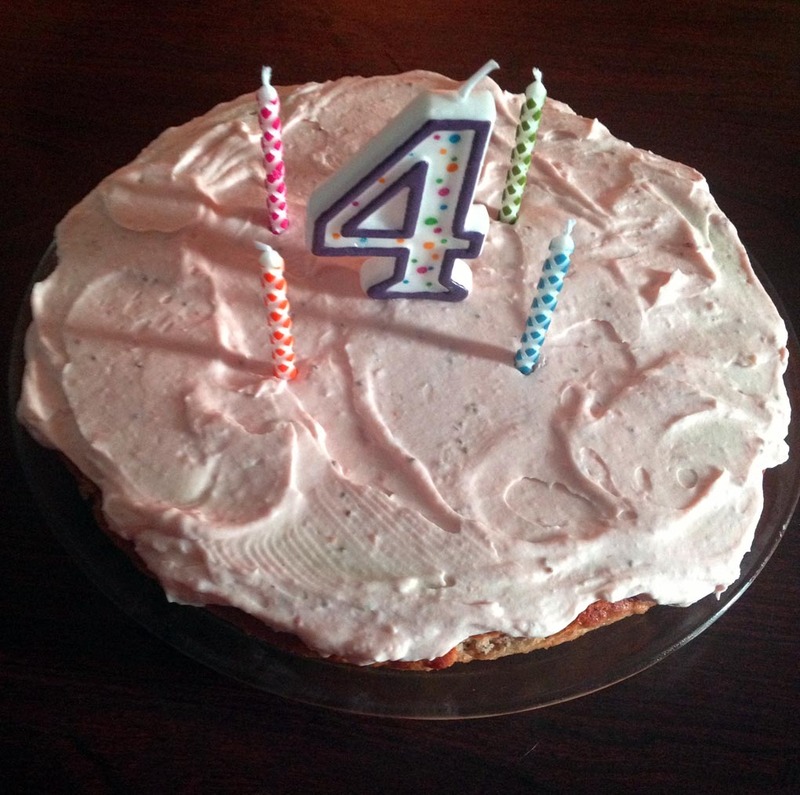 I solved it this year by making this strawberry lemon cake and waiting to put it together the day of, thanks to a fridge in the hotel room. It traveled well and thankfully I packed a knife for spreading of the frosting and cutting of the pieces. Worked like a dream and the whole thing was inhaled by us all. We kept to our food rules, had fun, and no sugar/wheat crash. Besides the princess paraphernalia (ugh) and first bicycle (yay), the cake was a favorite. She wanted a strawberry cake with strawberry frosting. Instead of repeating the cupcakes we made a while back I decided to try a cake with almond meal. I thought the almond and lemon would go wonderfully with the strawberries. The result had a much different texture compared to the coconut flour concoction we came up with before – good, but in a different way. The cake came out dense, very strawberry, very moist and nice and sweet, just like the birthday girl! In medium pan over medium heat melt the butter. Continue cooking it until the butter is brown and fragrant. Remove from heat and set aside. Preheat oven to 350 degrees. In a blender add eggs, cored and chopped strawberries, vanilla and lemon juice with meat. Blend until combined and strawberries are pureed. Add almond flour, flaxseed meal, salt, baking soda, erythritol, stevia. Blend some more until you have a smooth batter. Stir in butter until well combined. Line the bottom of a 9-inch round baking dish with parchment paper. Pour batter into pan, then drop strawberries into the batter, distributing them evenly. Bake in preheated oven for 25 – 30 minutes. The time may vary based on the juiciness of the strawberries. Remove from oven and let cool in the pan. When cool gently flip cake out of pan and place on serving dish. Frost as desired – I used the strawberry cream cheese version above – combine all ingredients together and whip until smooth. It may need to be chilled for a few minutes to firm up before spreading on the cake. Keep cake refrigerated if room temperature is over 75 degrees. Enjoy!